Pediatric bacterial meningitis is a life-threatening illness that results from bacterial infection of the meninges and leaves some survivors with significant sequelae. Therefore, meticulous attention must be paid to appropriate treatment and monitoring of patients with this disease. See Clinical Presentation for more specific information on the signs and symptoms of pediatric bacterial meningitis. Specific hematologic, radiographic (eg, computed tomography [CT] and magnetic resonance imaging [MRI]), and other studies assist in diagnosis. CT and MRI may reveal ventriculomegaly and sulcal effacement (see the image below). Acute bacterial meningitis. This axial nonenhanced CT scan shows mild ventriculomegaly and sulcal effacement. See Workup for more specific information on testing and imaging modalities for pediatric bacterial meningitis. See Treatment and Medication for more specific information on pharmacologic and other therapies for pediatric bacterial meningitis. Pediatric bacterial meningitis is a life-threatening illness that results from bacterial infection of the meninges. Because bacterial meningitis in the neonatal period has its own unique epidemiologic and etiologic features, it will be discussed separately in this article as necessary. Beyond the neonatal period, the 3 most common organisms that cause acute bacterial meningitis are Streptococcus pneumoniae, Neisseria meningitidis, and Haemophilus influenzae type b (Hib). Since the routine use of Hib, conjugate pneumococcal, and conjugate meningococcal vaccines in the United States, the incidence of meningitis has dramatically decreased. Although S pneumoniae is now the leading cause of community-acquired bacterial meningitis in the United States (1.1 cases per 100,000 population overall), the rate of pneumococcal meningitis is 59% lower than it was before the introduction of the conjugate pneumococcal vaccine in 2000. The incidence of disease caused by S pneumoniae is highest in children aged 1-23 months and in adults older than 60 years. Predisposing factors include respiratory infection, otitis media, mastoiditis, head trauma, hemoglobinopathy, human immunodeficiency virus (HIV) infection, and other immune deficiency states. Meningitis is a life-threatening illness and leaves some survivors with significant sequelae. Therefore, meticulous attention must be paid to appropriate treatment and monitoring of these patients. Patients require hospitalization for antibiotic therapy and appropriate support. Adequate fluid administration is necessary to maintain perfusion, especially cerebral perfusion. Fluid restrictions (to prevent cerebral edema) may be more harmful because patients may be under resuscitated. Antibiotics must be promptly administered. The emergence of penicillin-resistant S pneumoniae has resulted in new challenges in the treatment of bacterial meningitis. Bacteria reach the subarachnoid space via a hematogenous route and may directly reach the meninges in patients with a parameningeal focus of infection. Once pathogens enter the subarachnoid space, an intense host inflammatory response is triggered by lipoteichoic acid and other bacterial cell wall products produced as a result of bacterial lysis. This response is mediated by the stimulation of macrophage-equivalent brain cells that produce cytokines and other inflammatory mediators. This resultant cytokine activation then initiates several processes that ultimately cause damage in the subarachnoid space, culminating in neuronal injury and apoptosis. Interleukin (IL)–1, tumor necrosis factor alpha (TNF-a), and enhanced nitric oxide production play critical roles in triggering inflammatory response and ensuing neurologic damage. Infection and inflammatory response later affect penetrating cortical vessels, resulting in swelling and proliferation of the endothelial cells of arterioles. A similar process can involve the veins, causing mural thrombi and obstruction of flow. The result is an increase in intracellular sodium and intracellular water. The development of brain edema further compromises cerebral circulation, and this effect can result in increased intracranial pressure (ICP) and uncal herniation. Increased secretion of antidiuretic hormone (ADH), resulting in the syndrome of inappropriate antidiuretic hormone secretion (SIADH), occurs in most patients with meningitis and causes further retention of free water. These factors contribute to the development of focal or generalized seizures. 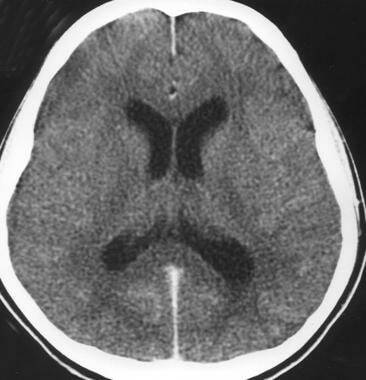 Severe brain edema also causes midline structures to shift caudally and become entrapped in the tentorial notch or foramen magnum. Caudal shifts produce herniation of the parahippocampal gyri, cerebellum, or both. These intracranial changes appear clinically as an alteration of consciousness and postural reflexes. Caudal displacement of the brainstem causes palsy of the third and sixth cranial nerves. If untreated, these changes result in decortication or decerebration and can progress rapidly to respiratory and cardiac arrest. Bacteria from the maternal genital tract colonize the neonate after rupture of membranes, and specific bacteria, such as group B streptococci (GBS), enteric gram-negative rods, and Listeria monocytogenes, can reach the fetus transplacentally and cause infection. Furthermore, newborns can also acquire bacterial pathogens from their surroundings, and several host factors facilitate a predisposition to bacterial sepsis and meningitis. Bacteria reach the meninges via the bloodstream and cause inflammation. After arriving in the central nervous system (CNS), bacteria spread from the longitudinal and lateral sinuses to the meninges, the choroid plexus, and the ventricles. IL-1 and TNF-a also mediate local inflammatory reactions by inducing phospholipase A2 activity, initiating the production of platelet-activating factor and the arachidonic acid pathway. This process results in production of prostaglandins, thromboxanes, and leukotrienes. Activation of adhesion-promoting receptors on endothelial cells by these cytokines attracts leukocytes, and the release of proteolytic enzymes from the leukocytes results in altered blood-brain permeability, activation of the coagulation cascade, brain edema, and tissue damage. Inflammation of the meninges and ventricles produces a polymorphonuclear response, an increase in cerebrospinal fluid (CSF) protein content, and utilization of glucose in CSF. Inflammatory changes and tissue destruction in the form of empyema and abscesses are more pronounced in gram-negative meningitis. Thick inflammatory exudate causes blockage of the aqueduct of Sylvius and other CSF pathways, resulting in both obstructive and communicating hydrocephalus. Bacteria are often acquired from the maternal vaginal flora. Gram-negative enteric flora and GBS are the dominant pathogens. In premature newborns who receive multiple antibiotics, those on hyperalimentation, and those who undergo various surgical procedures, Staphylococcus epidermidis and Candida species are uncommon but are reported in greater frequency in neonates. L monocytogenes is another well-known but fairly uncommon causative pathogen. Early-onset GBS meningitis occurs during the first 7 days of life as a consequence of maternal colonization and the absence of protective antibody in the neonate; it is often associated with obstetric complications. The disease is seen most often in premature or low-birth-weight babies. Pathogens are acquired before or during the birth process. Late-onset meningitis is defined as disease occurring after 7 days of life. Causes include perinatally acquired and nosocomial pathogens. Streptococcus agalactiae (GBS) is classified into 5 distinct serotypes: Ia, Ib, Ic, II, and III. Although these serotypes occur with almost equal frequency in the early onset of disease, serotype III causes 90% of late-onset disease. Use of respiratory equipment in the nursery increases the risk of infection caused by Serratia marcescens,Pseudomonas aeruginosa, and Proteus species. Invasive devices predispose infants to the infections caused by S epidermidis and Pseudomonas, Citrobacter, and Bacteroides species. Infection with Citrobacter diversus, Citrobacter koseri, Salmonella species, and Proteus species, though uncommon, carries a high mortality. These patients often develop brain abscesses, particularly those with Citrobacter, in whom meningitis produces brain abscesses in 80-90% of cases. In children older than 4 weeks, S pneumoniae and N meningitidis are the most common etiologic agents. Hib has essentially disappeared in countries where the conjugate vaccine is routinely used. S pneumoniae is a gram-positive, lancet-shaped diplococcus that is the leading cause of meningitis. Of the 84 serotypes, numbers 1, 3, 6, 7, 14, 19, and 23 are the ones most often associated with bacteremia and meningitis. Children of any age may be affected, but the incidence and severity are highest in very young and elderly persons. In patients with recurrent meningitis, predisposing factors are anatomic defects, asplenia, and primary immune deficiency. Often, the history includes recent or remote head trauma. This organism also has a predilection for causing meningitis in patients with sickle cell disease, other hemoglobinopathies, and functional asplenia. Immunity is type-specific and long-lasting. S pneumoniae colonizes the upper respiratory tract of healthy individuals; however, disease often is caused by a recently acquired isolate. Transmission is person-to-person, usually via direct contact; secondary cases are rare. The incubation period is 1-7 days, and infections are more common in winter, when viral respiratory disease is prevalent. The disease often results in sensorineural hearing loss, hydrocephalus, and other central nervous system (CNS) sequelae. Prolonged fever despite adequate therapy is common with S pneumoniae meningitis. Effective antimicrobial therapy can eradicate the organism from nasopharyngeal secretions within 24 hours. However, pneumococci have developed resistance to a variety of antibiotics; this development is seen worldwide. Rates of resistance to penicillin range from 10% to 60%. Multicenter surveillance of pneumococci isolated from the cerebrospinal fluid (CSF) has found resistance rates of 20% to penicillin and 7% to ceftriaxone. Penicillin resistance in pneumococci is due to alterations in enzymes necessary for growth and repair of the penicillin-binding proteins; thus, beta-lactamase inhibitors offer no advantage. Penicillin-resistant pneumococci are often resistant to trimethoprim-sulfamethoxazole, tetracyclines, chloramphenicol, and macrolides. However, selected third-generation cephalosporins (eg, cefotaxime and ceftriaxone) do exhibit activity against most penicillin-resistant pneumococcal isolates. At present, all pneumococcal isolates remain susceptible to vancomycin and various oxazolidinones. Several of the fluoroquinolones (eg, levofloxacin), though contraindicated in children, have excellent activity against most pneumococci and achieve adequate CNS penetration. Tolerance, a trait distinct from resistance, is the term used to characterize bacteria that stop growing in the presence of antibiotic yet do not lyse and die. Pneumococci that are tolerant of penicillin and vancomycin have been described in literature, and a subsequent link to recrudescent meningitis was described in 1 child. The overall incidence and clinical impact of such bacterial strains are unknown. However, the possibility of tolerance should be kept in mind in cases of recurrent pneumococcal meningitis. N meningitidis is a gram-negative, kidney bean–shaped organism that is frequently found intracellularly. Organisms are grouped serologically on the basis of capsular polysaccharide; A, B, C, D, X, Y, Z, 29E, and W-135 are the pathogenic serotypes. In developed countries, serotypes B, C, Y, and W-135 account for most childhood cases. Group A strains are most prevalent in developing countries and have resulted in epidemics of meningococcal meningitis throughout the world, as well as outbreaks in military barracks. The upper respiratory tract frequently is colonized with meningococci, and transmission is person-to-person via direct contact with infected droplets of respiratory secretions, often from asymptomatic carriers. The incubation period is generally less than 4 days (range, 1-7 days). Higher rates of fatality and physical sequelae (eg, scarring and amputation) are reported in survivors of serogroup C disease. Long-term sequelae are rare in patients who have an uneventful hospital course. Hib is a pleomorphic gram-negative rod whose shape varies from a coccobacillary form to a long curved rod. Hib meningitis occurs primarily in children who have not been immunized with Hib vaccine; 80-90% of cases occur in children aged 1 month to 3 years. By age 3 years, a significant number of nonimmunized children acquire antibodies against the capsular polyribophosphate of Hib, which are protective. The mode of transmission is person-to-person via direct contact with infected droplets of respiratory secretions. The incubation period generally is less than 10 days. Current mortality is less than 5%. Most fatalities occur during the first few days of the illness. Plasmid-mediated resistance to ampicillin due to the production of beta-lactamase enzymes by bacterium is increasingly being reported: 30-35% of Hib isolates are now ampicillin-resistant. As many as 30% of cases may have subtle long-term sequelae. Administration of dexamethasone early in treatment reduces morbidity and sequelae. L monocytogenes causes meningitis in newborns, immunocompromised children, and pregnant women. The disease also has been associated with the consumption of contaminated foods (eg, milk and cheese). Most cases are caused by serotypes Ia, Ib, and IVb. Signs and symptoms in patients with listerial meningitis tend to be subtle, and diagnosis often is delayed. In the laboratory, this pathogen can be misidentified as a diphtheroid or a hemolytic streptococcus. S epidermidis and other coagulase-negative staphylococci frequently cause meningitis and CSF shunt infection in patients with hydrocephalus or those who have undergone neurosurgical procedures. Immunocompromised children can develop meningitis caused by Pseudomonas, Serratia,Proteus, and diphtheroids. Children with facial cellulitis, periorbital cellulitis, sinusitis, and septic arthritis have an increased risk of meningitis. Use of Hib and pneumococcal vaccines decreases the likelihood of infection from these agents. The advent of vaccine has changed the incidence of pediatric bacterial meningitis. Before the routine use of the pneumococcal conjugate vaccine, the incidence of bacterial meningitis in the United States was about 6000 cases per year; roughly half of these were in pediatric patients (≤18 years). N meningitidis caused about 4 cases per 100,000 children (aged 1-23 months). The rate of S pneumoniae meningitis was 6.5 cases per 100,000 children (aged 1-23 months). Today, disease caused by H influenzae, S pneumoniae, and N meningitidis is much less common. The advent of universal Hib vaccination in developed countries has led to the elimination of more than 99% of invasive disease. Protection continues even when Hib is coadministered with other vaccines. Just as important, the vaccine continues to confer immunity into later childhood. Vaccine for Neisseria, however, has not been efficacious in younger children. This is due to poor immunogenic response. Current recommendations target immunization for children older than 2 years and high-risk patients with asplenic and terminal complement deficiencies. In addition, young adults living in close quarters, such as dormitories or military barracks, will benefit. The incidence of neonatal bacterial meningitis is 0.25-1 case per 1000 live births (0.15 case per 1000 full-term births and 2.5 cases per 1000 premature births). Approximately 30% of newborns with clinical sepsis have associated bacterial meningitis. After the initiation of intrapartum antibiotics in 1996, the national incidence of early-onset GBS infection decreased substantially, from approximately 1.8 cases per 1000 live births in 1990 to 0.32 case per 1000 live births in 2003. In a survey by the Hib and Pneumococcal Working Group, the incidence of meningitis in 2000 varied in different regions of the world. The overall incidence of pneumococcal meningitis was 17 cases per 100,000, with the highest incidence in Africa, at 38 cases per 100,000, and the lowest incidence in Europe, at 6 cases per 100,000. The overall death rate was 10 cases per 100,000. The death rate was highest in Africa, at 28 cases per 100,000, and lowest in Europe and Western Pacific regions, at 3 cases per 100,000. A similar trend was identified for Hib meningitis. The overall incidence of Hib meningitis in 2000 was 31 cases per 100,000. The African region had the highest rate, at 46 cases per 100,000, and Europe had the lowest, at 13 cases per 100,000. The overall death rate was 13 cases per 100,000. The highest death rate was in Africa, at 31 cases per 100,000, and the lowest was in Europe, at 4 cases per 100,000. Pediatric bacterial meningitis is most common in children younger than 4 years, with a peak incidence in those aged 3-8 months. Male infants have a higher incidence of gram-negative neonatal meningitis. Female infants are more susceptible to L monocytogenes infection. S agalactiae (GBS) affects both sexes equally. Bacterial meningitis occurs more frequently in black, Native American, and Hispanic children; this is thought to be related to socioeconomic rather than racial factors. Mortality and morbidity depend on the infectious agent, the age of the child, the child’s general health, and the promptness of diagnosis and treatment. Despite improvements in antibiotic and supportive therapy, death and complication rates remain significant. Overall mortality for bacterial meningitis is 5-10% and varies according to the causative organism and the patient’s age. In neonates, mortality is 15-20%, whereas in older children, it is 3-10%. Of the meningitides caused by the most common pathogens, S pneumoniae meningitis has the highest mortality, at 26.3-30%; Hib meningitis has the next highest, at 7.7-10.3%; and N meningitidis has the lowest, at 3.5-10.3%. Prolonged or difficult-to-control seizures, especially after hospital day 4, are predictors of a complicated hospital course with serious sequelae. On the other hand, seizures that occur during the first 3 days of illness usually have little prognostic significance. Approximately 6% of affected infants and children show signs of DIC and endotoxic shock. These signs are indicative of a poor prognosis. Studies have documented the development of profound bilateral hearing loss, which may occur in as many as 4% of all bacterial meningitis cases. Sensorineural hearing loss is one of the most frequent problems. Children at greatest risk for hearing loss include those with evidence of increased ICP, those with abnormal findings on computed tomography (CT), males, those with low CSF glucose levels, those with S pneumoniae infection , and those with nuchal rigidity. Because many of the children affected are very young and lack mature cognitive and motor skills, some of the sequelae may not be recognized for years. In a study that followed children who recovered from meningitis for 5-10 years, 1 of every 4 school-aged meningitis survivors had either serious and disabling sequelae or a functionally important behavior disorder or neuropsychiatric or auditory dysfunction that impaired their performance in school. For tuberculous meningitis, morbidity and mortality are related to the stage of the disease. The rate of significant morbidity is 30% for stage I, 56% for stage II, and 94% for stage III. Because of the high incidence of sequelae, parents should be cautioned from the beginning that even with appropriate medical care, the child may have some complications. Respond promptly to parents’ concerns with adequate documentation. Careful neurologic examination and visual and hearing screening tests (brainstem evoked potentials) should be obtained and reviewed with parents so that parents are aware of any deficits. Early detection of deficits should result in initiating appropriate physical and occupational therapy and in acquiring other devices or modalities required by the patient to achieve the maximum possible benefit. Nigrovic LE, Malley R, Kuppermann N. Meta-analysis of bacterial meningitis score validation studies. Arch Dis Child. 2012 Jul 4. [Medline]. [Guideline] Tunkel AR, Hartman BJ, Kaplan SL, et al. Practice guidelines for the management of bacterial meningitis. Clin Infect Dis. 2004 Nov 1. 39(9):1267-84. [Medline]. AAP. Pickering LK, Baker CJ, Kimberlin DW, et al eds. 2009 Red Book. 28th ed. American Academy of Pediatrics; 2009. Ouchenir L, Renaud C, Khan S, Bitnun A, Boisvert AA, McDonald J, et al. The Epidemiology, Management, and Outcomes of Bacterial Meningitis in Infants. Pediatrics. 2017 Jul. 140 (1):[Medline]. Sridhar S, Greenwood B, Head C, et al. Global incidence of serogroup B invasive meningococcal disease: a systematic review. Lancet Infect Dis. 2015 Nov. 15 (11):1334-46. [Medline]. Haddy RI, Perry K, Chacko CE, Helton WB, Bowling MG, Looney SW, et al. Comparison of incidence of invasive Streptococcus pneumoniae disease among children before and after introduction of conjugated pneumococcal vaccine. Pediatr Infect Dis J. 2005 Apr. 24(4):320-3. [Medline]. Nigrovic LE, Kuppermann N, Malley R. Children with bacterial meningitis presenting to the emergency department during the pneumococcal conjugate vaccine era. Acad Emerg Med. 2008 Jun. 15(6):522-8. [Medline]. Nigrovic LE, Malley R, Kuppermann N. Cerebrospinal fluid pleocytosis in children in the era of bacterial conjugate vaccines: distinguishing the child with bacterial and aseptic meningitis. Pediatr Emerg Care. 2009 Feb. 25(2):112-7; quiz 118-20. [Medline]. Thigpen MC, Whitney CG, Messonnier NE, et al. Bacterial meningitis in the United States, 1998-2007. N Engl J Med. 2011 May 26. 364(21):2016-25. [Medline]. MacNeil JR, Bennett N, Farley MM, Harrison LH, Lynfield R, Nichols M, et al. Epidemiology of infant meningococcal disease in the United States, 2006-2012. Pediatrics. 2015 Feb. 135 (2):e305-11. [Medline]. Levine OS, Knoll MD, Jones A, Walker DG, Risko N, Gilani Z. Global status of Haemophilus influenzae type b and pneumococcal conjugate vaccines: evidence, policies, and introductions. Curr Opin Infect Dis. 2010 Jun. 23(3):236-41. [Medline]. O'Brien KL, Wolfson LJ, Watt JP, Henkle E, Deloria-Knoll M, McCall N, et al. Burden of disease caused by Streptococcus pneumoniae in children younger than 5 years: global estimates. Lancet. 2009 Sep 12. 374(9693):893-902. [Medline]. Watt JP, Wolfson LJ, O'Brien KL, Henkle E, Deloria-Knoll M, McCall N, et al. Burden of disease caused by Haemophilus influenzae type b in children younger than 5 years: global estimates. Lancet. 2009 Sep 12. 374(9693):903-11. [Medline]. McIntyre PB, Macintyre CR, Gilmour R, Wang H. A population based study of the impact of corticosteroid therapy and delayed diagnosis on the outcome of childhood pneumococcal meningitis. Arch Dis Child. 2005 Apr. 90(4):391-6. [Medline]. [Full Text]. Kutz JW, Simon LM, Chennupati SK, Giannoni CM, Manolidis S. Clinical predictors for hearing loss in children with bacterial meningitis. Arch Otolaryngol Head Neck Surg. 2006 Sep. 132(9):941-5. [Medline]. Molyneux E, Nizami SQ, Saha S, et al. 5 versus 10 days of treatment with ceftriaxone for bacterial meningitis in children: a double-blind randomised equivalence study. Lancet. 2011 May 28. 377(9780):1837-45. [Medline]. Ku LC, Boggess KA, Cohen-Wolkowiez M. Bacterial meningitis in infants. Clin Perinatol. 2015 Mar. 42 (1):29-45, vii-viii. [Medline]. Nigrovic LE, Kuppermann N, Macias CG, Cannavino CR, Moro-Sutherland DM, Schremmer RD, et al. Clinical prediction rule for identifying children with cerebrospinal fluid pleocytosis at very low risk of bacterial meningitis. JAMA. 2007 Jan 3. 297(1):52-60. [Medline]. Dubos F, Korczowski B, Aygun DA, Martinot A, Prat C, Galetto-Lacour A, et al. Serum procalcitonin level and other biological markers to distinguish between bacterial and aseptic meningitis in children: a European multicenter case cohort study. Arch Pediatr Adolesc Med. 2008 Dec. 162(12):1157-63. [Medline]. Dubos F, Martinot A, Gendrel D, Bréart G, Chalumeau M. Clinical decision rules for evaluating meningitis in children. Curr Opin Neurol. 2009 Jun. 22(3):288-93. [Medline]. Kanegaye JT, Nigrovic LE, Malley R, Cannavino CR, Schwab SH, Bennett JE, et al. Diagnostic value of immature neutrophils (bands) in the cerebrospinal fluid of children with cerebrospinal fluid pleocytosis. Pediatrics. 2009 Jun. 123(6):e967-71. [Medline]. Greenberg RG, Smith PB, Cotten CM, Moody MA, Clark RH, Benjamin DK Jr. Traumatic lumbar punctures in neonates: test performance of the cerebrospinal fluid white blood cell count. Pediatr Infect Dis J. 2008 Dec. 27(12):1047-51. [Medline]. [Full Text]. Neuman MI, Tolford S, Harper MB. Test characteristics and interpretation of cerebrospinal fluid gram stain in children. Pediatr Infect Dis J. 2008 Apr. 27(4):309-13. [Medline]. Byington CL, Kendrick J, Sheng X. Normative cerebrospinal fluid profiles in febrile infants. J Pediatr. 2011 Jan. 158(1):130-4. [Medline]. [Full Text]. Ray B, Rylance G. QUESTION 1. Normal CSF: does it exclude meningitis?. Arch Dis Child. 2009 Dec. 94(12):988-91. [Medline]. Ye Q, Shao WX, Shang SQ, et al. Clinical Value of Assessing Cytokine Levels for the Differential Diagnosis of Bacterial Meningitis in a Pediatric Population. Medicine (Baltimore). 2016 Mar. 95 (13):e3222. [Medline]. [Full Text]. Nigrovic LE, Malley R, Macias CG, Kanegaye JT, Moro-Sutherland DM, Schremmer RD, et al. Effect of antibiotic pretreatment on cerebrospinal fluid profiles of children with bacterial meningitis. Pediatrics. 2008 Oct. 122(4):726-30. [Medline]. Fein D, Avner JR, Khine H. Pattern of pain management during lumbar puncture in children. Pediatr Emerg Care. 2010 May. 26(5):357-60. [Medline]. Boelman C, Shroff M, Yau I, et al. Antithrombotic therapy for secondary stroke prevention in bacterial meningitis in children. J Pediatr. 2014 Oct. 165(4):799-806. [Medline]. [Full Text]. Karageorgopoulos DE, Valkimadi PE, Kapaskelis A, Rafailidis PI, Falagas ME. Short versus long duration of antibiotic therapy for bacterial meningitis: a meta-analysis of randomised controlled trials in children. Arch Dis Child. 2009 Aug. 94(8):607-14. [Medline]. van de Beek D, Brouwer MC. No difference between short-course and long-course antibiotics for bacterial meningitis in children, but available evidence limited. Evid Based Med. 2010 Feb. 15(1):6-7. [Medline]. van de Beek D, de Gans J, McIntyre P, Prasad K. Corticosteroids for acute bacterial meningitis. Cochrane Database Syst Rev. 2007. (1):CD004405. [Medline]. Mongelluzzo J, Mohamad Z, Ten Have TR, Shah SS. Corticosteroids and mortality in children with bacterial meningitis. JAMA. 2008 May 7. 299(17):2048-55. [Medline]. [Guideline] Saari TN. Immunization of preterm and low birth weight infants. American Academy of Pediatrics Committee on Infectious Diseases. Pediatrics. 2003 Jul. 112(1 Pt 1):193-8. [Medline]. Centers for Disease Control and Prevention (CDC). Ten great public health achievements--worldwide, 2001-2010. MMWR Morb Mortal Wkly Rep. 2011 Jun 24. 60(24):814-8. [Medline]. Centers For Disease Control and Prevention. CDC Advisory Committee on Immunization Practices Recommends HibMenCY for Infants at Increased Risk for Meningococcal Disease. Oct 24, 2012. Available at: Accessed Nov 13, 2012. [Full Text]. Cohn AC, MacNeil JR, Clark TA, Ortega-Sanchez IR, Briere EZ, Meissner HC, et al. Prevention and control of meningococcal disease: recommendations of the Advisory Committee on Immunization Practices (ACIP). MMWR Recomm Rep. 2013 Mar 22. 62:1-28. [Medline]. Novartis Vaccines. FDA expands age indication for Menveo®, first and only quadrivalent meningococcal vaccine for infants as young as 2 months of age. Available at http://www.novartisvaccines.com/newsroom/media-releases/2013/US_Menveo_Infant_FDA_Approval_Press_Release_US.pdf. Accessed: August 7, 2013. Thomson J, Sucharew H, Cruz AT, Nigrovic LE, Freedman SB, Garro AC, et al. Cerebrospinal Fluid Reference Values for Young Infants Undergoing Lumbar Puncture. Pediatrics. 2018 Mar. 141 (3):672-81. [Medline]. Acute bacterial meningitis. This axial T2-weighted MRI shows only mild ventriculomegaly. Acute bacterial meningitis. This contrast-enhanced, axial T1-weighted MRI shows leptomeningeal enhancement (arrows). *The dosage stated is the highest within the dosage range. † Serum levels must be monitored when patient has kidney disease or is receiving other nephrotoxic drugs; adjust doses accordingly. *Experience with this agent in pediatric patients is minimal; it is not licensed for treatment of meningitis. † Because of possible seizures, this agent must be used with caution in treating meningitis.